Kelly and I are hanging up our earbuds and retiring the monthly AudioSynced Roundup. 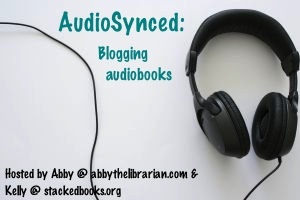 While we have LOVED hosting the roundup and seeing so many great audiobooks getting attention throughout the blogosphere, we're both in a position where we're unable to make audiobooks a big part of our lives like they have been in the past. It's time for us to move on to other projects. If you're looking for great audiobook reviews (and I hope you are! ), please remember that Audiobook Jukebox continues to collect audiobook reviews from around the internet. You should also definitely add Reading With My Ears to your blogroll, as Lee posts many fantastic reviews each month. And don't forget about the great audiobook lists on the American Library Association's website: Amazing Audiobooks for Young Adults, Children's Notable Recordings, and the Odyssey Award. You may also want to check out other audiobook awards like the Audies or the Grammys. And both Kelly and I are absolutely fine if anyone is inspired to pick up the torch and start hosting some kind of audiobook review roundup. Go for it! It's been a pleasure listening with you these past few years. Would you please tell us your favorite audiobook(s) or audiobook blog in the comments?